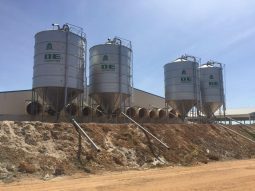 DE Engineers have been the major suppliers of feed silos in W.A. since feed was handled in bags back in the 60’s. All silos bases are are made from hot dipped galvanised pipe for longer life and are designed to meet all relevant standards. Blow feed tubes, silo vents, safety ladders, steeper cones and slide shut off plates as standard.